Beginning in late October, Monarch butterflies west of the Continental Divide migrate to the California Coast to overwinter and escape the frigid winter temperatures found in higher elevations. 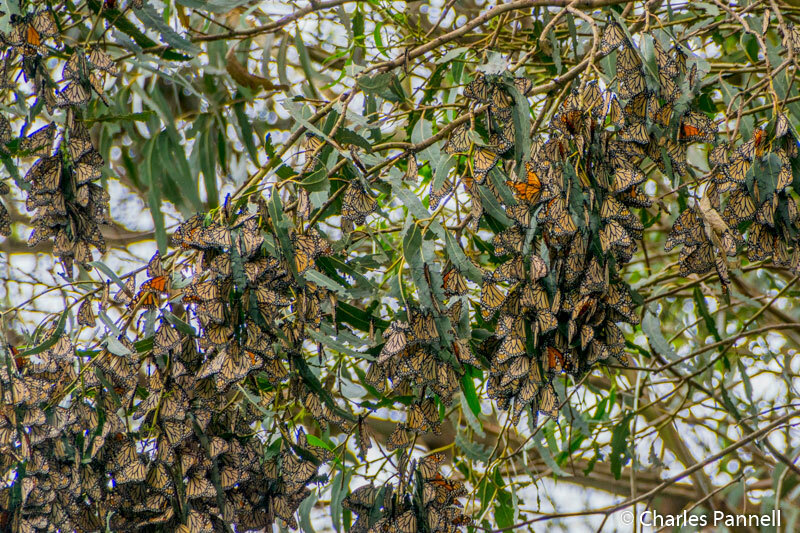 During this time, the Monarchs can be found clustering in large masses in coastal eucalyptus and cypress trees, in order to share their body heat and discourage predators. 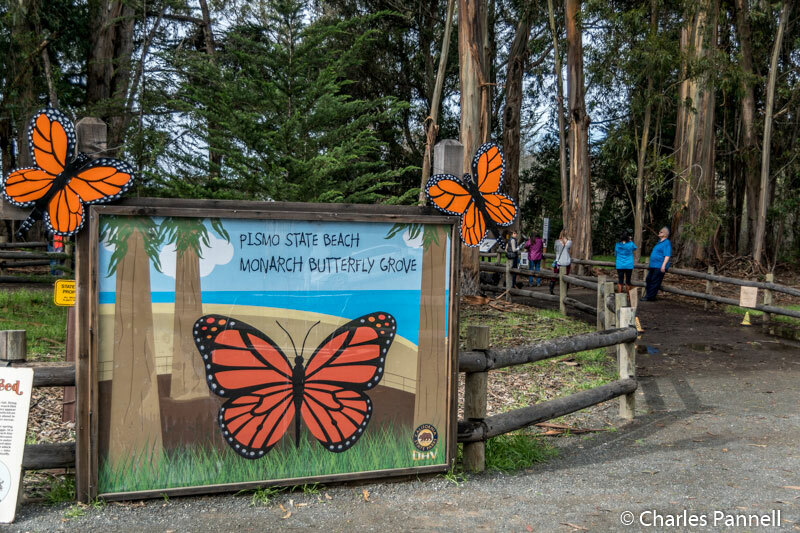 And although the lion’s share of these overwintering sites are located on private land, these three public Monarch viewing venues near Pismo Beach also offer good access for wheelchair-users and slow walkers. Located just south of the North Beach Campground on Highway 1, the Pismo Beach Monarch Butterfly Grove (www.monarchbutterfly.org/ ) is home to one of the largest overwintering Monarch colonies in the area. In fact, the count from the 2016 season tallied the migratory population at over 28,000 butterflies. There’s no marked parking for the grove, but parallel parking is available along Highway 1. From there, you’ll find curb-cut access to a hard-packed dirt trail that winds around to the eucalyptus grove. Volunteers are on duty during the season — from October to February — and spotting scopes are placed in the grove to help visitors get a closer look at the hibernating Monarchs. To be honest, the clumps of butterflies look like masses of dead leaves at first, but upon closer examination the Monarchs become more apparent. There are also a number of interpretive panels around the grove, and docent programs are conducted during the hibernation season. And if you’d like to pack along a picnic lunch there are a few standard picnic tables located on level ground near the docent trailer. An accessible porta-potty is located nearby, and there’s also a nice selection of butterfly-themed merchandise available in the docent trailer. Truly, if you can only make one Monarch stop, this is the one to hit. Another good Monarch viewing area is located at Oceano Campground (www.parks.ca.gov/?page_id=595), which is about two miles south of the Pismo Beach Monarch Grove, on Pier Avenue. Although this site doesn’t attract the large numbers of butterflies that the Pismo site does, it does offer the opportunity to get a closer look at them. Accessible parking is located near the visitor center, right before you enter the campground. 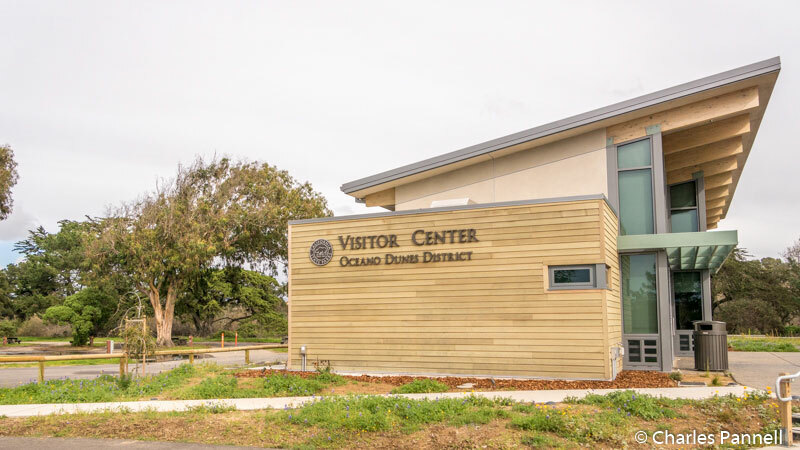 From there, a barrier-free path leads over to the accessible visitor center and restrooms, while the paved campground road winds over to the Monterey cypress grove where the butterflies roost. The placement of the trees is the big draw to this site, as the Monarchs roost 15 feet above the ground, so it’s easy to get a close look at them. And if you have any Monarch-related questions, head on over to the visitor center, which is staffed with helpful docents during the peak Monarch season. Finally, if you haven’t had your fill of butterflies, then head over to Sweet Springs Nature Preserve (www.morrocoastaudubon.org/p/sweet-springs-nature-preserve.html) in Los Osos for yet another look at the hibernating beauties. From Oceano Campground take Highway 1 north to South Bay Boulevard, then turn right on Santa Ysabel Avenue. Next, take a left on 7th Street and a right on Ramona Avenue. Sweet Springs Nature Preserve is located on the the right, next to a prominent sign which marks the entrance. Part of the Audubon Nature Preserve, this 24-acre vegetative restoration project features about a mile of accessible trails; and although it’s a minor Monarch viewing site, it’s also pleasantly devoid of the seasonal crowds. There’s no official parking at the preserve, however it’s possible to parallel park on the street outside the main entrance. 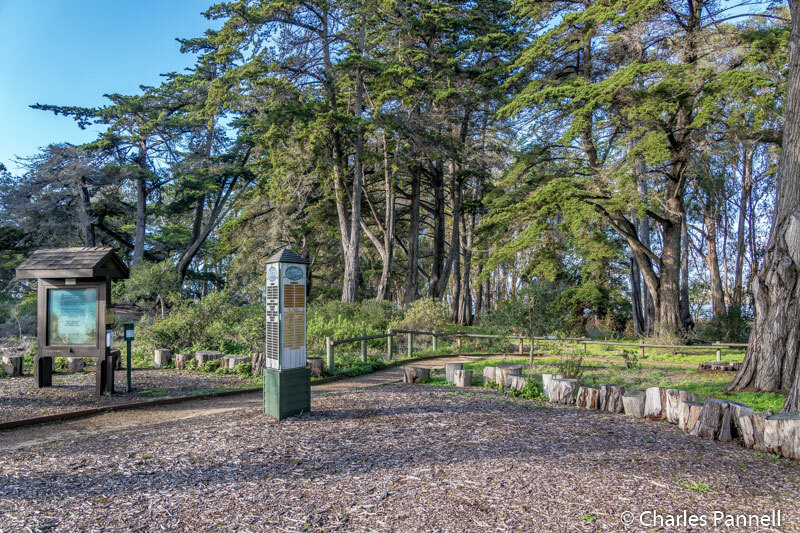 There’s curb-cut access up to the sidewalk and barrier-free access to the preserve itself. From there a hard-packed dirt trail leads through the shaded eucalyptus grove where it’s estimated that some 8,000 Monarchs overwinter. And don’t miss the trail at far end of the preserve. 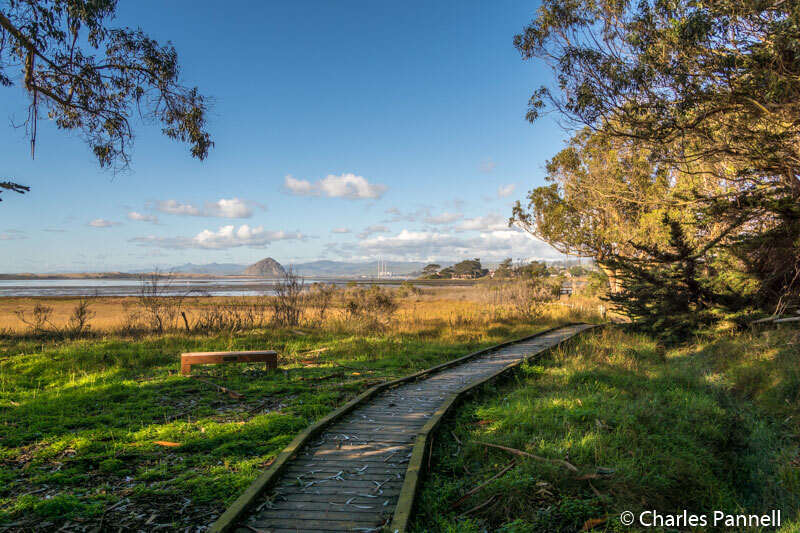 To find it, continue along Ramona Avenue and turn right on Broderson, which dead-ends into an equally accessible boardwalk through the preserve. And if you don’t happen to spy any butterflies, it’s not a total loss, as the preserve offers a pleasant walk through the woods. And that it itself is reason enough to add this stop to your must-do list.